Morton A. Meyers • Palgrave MacMillan, 2012, 262 pp. 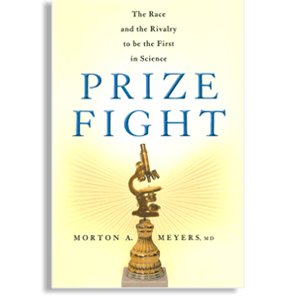 Amid all the high-falutin’ blather about truth being the goal of science, where does recognition — especially in the form of big prizes — fit in? The noble Nobel has recognized erroneous, even horrendous, discoveries, including the lobotomy (1949), a surgery that butchered the brains of thousands of mental patients. And the Nobel has ignored a breakthrough as monumental as Dmitri Mendeleev’s periodic table. More often, Nobels are given to some scientists while ignoring others. Lise Meitner, for example, discovered nuclear fission with Otto Hahn at the dawn of World War II. In 1944, just before the atomic bomb proved that this discovery really mattered, Hahn received a solo Nobel. These disputes can spark scientific vendettas. Prize Fight dwells on a nobody-wins struggle between Selman Waksman and graduate student Albert Schatz over the discovery of streptomycin in 1943. The drug, the first antibiotic to defeat the large group of Gram-negative bacteria, was distilled from a soil microorganism that Waksman knew well, but Schatz — through intense effort — was the person who isolated a substance that could heal tuberculosis. In the end, Waksman got the Nobel, and Schatz, blackballed by Waksman, died a bitter man. Meyers gets bogged down in a dissertation on a battle over credit for magnetic resonance imaging (MRI) that fulminated in 2003, when Raymond Damadian bought newspaper ads attacking the Nobel judges for ignoring his contributions to the invention of MRI. No question that, as Meyers says, personalities got in the way in both cases. But how appropriate is the obsession with “who found it first?” when science moves more by increment than by breakthrough? We’ve just read that a huge international collaboration has apparently discovered the Higgs boson. Are prizes that recognize individuals or a small group obsolete?